‘Haryana’ is a correction of the word ‘Hariana’, which refers to the region as ‘the heaven on earth’, and finds mention in a 1328 AD Sanskrit inscription kept in the Delhi Museum. In the epic Mahabharat, which gave to this region worldwide fame, Haryana is referred to as ‘Bahudhhanyaka’, ‘land of plentiful grains’ and ‘Bahudhana’, ‘the land of immense riches’. Haryana has a glorious history going as far back as the Vedic Age. The State was the home of the legendary Bharata dynasty, from which the country derived its name ‘Bharat’. Vedas were written here; Lord Krishna delivered the famous Bhagwad-Gita sermon in the midst of the Mahabharata War; and on this very land, Ved Vyas wrote the epic ‘Mahabharata’ in Sanskrit. Four most famous battles : The Mahabharata War between Kaurvas and Pandavas at Kurukshetra, the battle between Prithviraj Chauhan and Mohammed of Ghaur at Traori in 1191, and the three battles of Panipat between (i) Zaheeruddin Babar and Ibrahim Lodhi, the Sultan of Delhi in 1526, (ii) Akbar and Hemu (Hem Chandra Vikramaditya) in 1556 and (iii) the Marathas and Ahmed Shah Abdali in 1761, were fought on this soil. The State continued to play a leading part in the history of India till the advent of the Muslims and the rise of Delhi as the imperial capital of India. Thereafter, Haryana functioned more or less as an adjunct to Delhi and practically remained anonymous till the First War of India's Independence in 1857. When the rebellion was crushed and the British administration was re-established, the Nawabs of Jhajjar and Bahadurgarh, Raja of Ballabgarh, and Rao Tula Ram of Rewari of the Haryana region were deprived of their territories. Their territories were either merged with the British territories or handed over to the rulers of Patiala, Nabha and Jind as a reward for their support and acceptance of the British hegemony. Haryana, thus, became a part of the Punjab province. Having experienced ups and downs over centuries, Haryana came into existence as a full-fledged State with the reorganisation of Punjab on November 1, 1966. Haryana is situated between Latitudes 27°39 and 30°55 N. and Longitudes 74°27.8 and 77°36.5 E. It is surrounded by Uttar Pradesh on the East, Punjab on the West, Himachal Pradesh on the North, and Rajasthan on the South. New Delhi, the National capital, juts out conspicuously on its South-Eastern extremity. 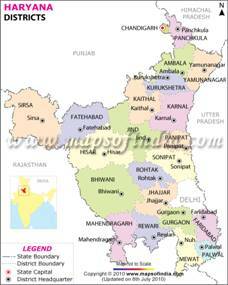 Haryana has an area of 44,212 sq. kms, and population 2,10,82, 989 (Census of India 2001). The state comprises 4 divisions - Ambala, Gurgaon, Rohtak, and Hisar - and 21 districts - Ambala, Bhiwani, Faridabad, Fatehabad, Gurgaon, Hisar, Jhajjar, Jind, Kaithal, Karnal, Kurukshetra, Mahendragarh, Mewat, Palwal, Panipat, Punchkula, Rewari, Rohtak, Sirsa, Sonepat, and Yamunanagar. It is a predominantly rural state with 70% of its population living in 7073 villages, and the remaining 30% percent in 11 small cities and 70 towns. Physically, the state falls into two broad geographical divisions : (i) the Sub-Himalayan Tract; and (ii) the Indo-Gangetic plain, which run almost parallel to each other. But for the Yamuna, which defines the state’s Eastern boundary with Uttar Pradesh, there is no perennial river here. The soil is for the most part medium-textured. Barring a part of Mahendragarh, there is a scarcity of mineral wealth in the state. The climate is tropical and the rainfall in major part is inadequate. Agriculture is the mainstay of more than 65 per cent population with a contribution of 26.4 per cent in the state GDP. Rice, wheat, jowar, bajra, maize, barley and pulses, sugarcane, cotton, oilseeds and potato are the major crops. The food grain production has increased manifold from nearly 2.59 millon tonnes at the time of inception of the State in 1966 to 16.2 million tonnes in 2009-2010. Haryana’s annual food grain production pegs at 7% of the national production. The state plays a critical role in ensuring food security in the country by contributing about 14% to the central food grain buffer stock every year. Besides agriculture, the state has a large industrial base having more than 1,347 large and medium, and 80,000 small scale units. The State is the largest producer of passenger cars, tractors, motorcycles, bicycles, refrigerators, scientific instruments, nuts & bolts, etc. Panipat handlooms and carpets are known all over the world, besides being famous for its ‘Pancharanga’ brands of pickles. Haryana was the first state to conceive the establishment of a chain of tourist complexes in public sector immediately after its formation. The 44 such complexes which are strategically located all over the State are truly magnificent in concept, style and content. Some of them are: Surajkund, Damdama and Shama in Gurgaon, Morni Hills in Panchkula, Ethnic India at Rai, Blue Jay at Samalkha, Skylark at Panipat, Karna Lake and Oasis at Karnal, Parakeet at Pipli, Kingfisher at Ambala, Magpie at Faridabad, Dabchick at Hodal, Jungle Babbler at Dharuhera, Gauriyya at Bahadurgarh, Tilyar and Myna at Rohtak, Blue Bird at Hisar, Red Bishop in Panchkula, and Pinjore Gardens at Pinjore. The Surajkund Crafts Mela that is held in February every year, is famous for the preservation and promotion of India’s art and culture. The artisans from across the country participate in the Mela to exhibit their skills. Similarly, to promote the ancient heritage of Pinjore, the Pinjore Heritage Festival is celebrated every year. Chandigarh, Kurukshetra and Pinjore are the major attractions for tourists from India and abroad. Education is a potential tool for empowerment of people. With this policy as an objective, the state has developed a network of educational institutions. While a primary school is available within a radius of one kilometer, middle level education facilities are available within a radius of 1.87 kilometer, and high schools are available within a radius of 2.1 kilometers. There were 11,013 Primary Schools, 1,918 Middle Schools, 3,023 High Schools and 1,301 Senior Secondary Schools in the State during 2001-2002. There are 9 state universities, 1 central university, 1 state deemed university, 3 central deemed universities, and a large number of colleges of general education, colleges offering professional courses, polytechnics, and Industrial Training Institutes. Free education to women upto graduation level is the hallmark of the state’s education policy. The literacy rate had gone up from 19.92 % at the time of its inception to 68.59% in 2001-02. Pro-investment IT Policy and incentives to IT Industry have resulted in setting up Technology Parks, Cyber cities and IT corridors in Gurgaon, Panchkula, Faridabad, and other areas in the NCR region. In fact, Gurgaon has become a preferred investment destination for both IT and ITES/BPO companies. Hi-Tech Habitat Centre in the Electronic City in Gurgaon with world-class facilities is in the offing. The software exports alone from Haryana during 2007-08 fetched about Rs. 17,500 crores. Such projects are creating employment opportunities for thousands and bringing economic prosperity to the state. The state is in the vanguard to exploit the IT power. There are three Flying Clubs - one each at Karnal, Hisar and Pinjore - where flying is taught. Private Pilot License (PPL) can be obtained from these clubs. The State has been making steady socio-economic progress ever since it was carved out. Its prosperity can be gauged from the fact of achieving the distinction of becoming the first State in the country with 100 per cent rural electrification and metalled road connectivity as early as 1970. Haryana now has third highest per capita income in the country. The simple and hardworking people of Haryana pride themselves, being firm believers in equity, social harmony and peaceful coexistence of all. The increased spending on expansion of educational facilities at all levels, investment-friendly policyies, widening of industrial base, building of infrastructure, and peaceful general enviroment together promse a rapid alround growth and development of the State and socio-economic development and prosperity of its people in the years ahead.